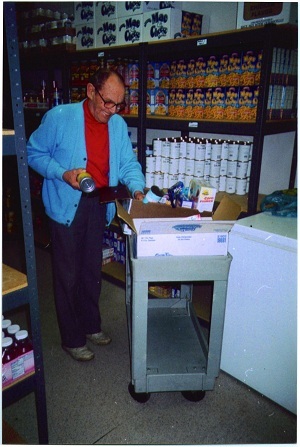 Parishioners collect nonperishable food donations, deliver them to help stock the pantry, and also help staff the pantry on a regular basis, filling orders for needy clients. To see a list of food needed for the pantry and instructions on how to donate, click here. To volunteer for this year-round ministry, click here. In August, parishioners donate school supplies and help staff the application process for this program, program, which provides school supplies to help children get their school year off to a positive start. Though this program happens mostly in late summer, you can collect items year round when you see a sale. For a list of needed items and instructions on how to donate, click here. Parishioners donate time to process applications for Christmas food baskets and Toys for Tots. To learn more about this late October/early November program, click here. Parishioners sign up for two-hour shifts as Salvation Army bell ringers at the Kroger South location. To volunteer for this December program (in November or early December), sign up in the great hall, call the church office, or click here. For the past several years, we have “adopted” a family for Christmas, providing gifts for adults and children in the family (including handmade scarves and hats). “Wishes” are conveyed via an angel tree in the parish hall, and gifts are wrapped as part of our annual “Greening of the Church” celebration. For dates and information about this program in December, watch the “What’s New” section of this website or email our deacon, the Rev. Deby Veach. For seven years now, St. Stephen’s has held a spring tag sale and earmarked the proceeds to the Salvation Army. More recently, we have focused this outreach to provide the pantry with extra kid-friendly food for kids who don’t receive subsidized lunches during the summer. Thanks to Bob Baesler of Baesler’s Market, we’ve been able to purchase soup, cereal, and peanut butter at wholesale prices, increasing our purchasing power. To arrange to donate items for tag sale (year round), contact the church office or click here. To volunteer to help with the tag sale in the spring, watch the “What’s New” section of this website or click here.